Perhaps it is a paradox to follow writing about “Your Inner Child”, the importance of laughter, fun and looking through the eyes of a curious child, with a post about suffering and dying. But life is like that—days that are filled with humor, adventure and joy; followed by days of fear, avoidance, pain and grief; and then there are just plain, ordinary days. On the ordinary days, we long for something more exciting. In the midst of darkness, we would settle for the ordinary. Life is like that. It is natural to avoid pain and to seek comfort, but perhaps in controlling so many aspects of our lives—by numbing, avoiding, manipulating, quitting, leaving or even dying—we deny ourselves an intimacy with God and others. The news about Brittany Maynard choosing to end her life “with dignity”, before terminal brain cancer caused her death, has saddened me. I believe in a God of surprises, a God of perfect timing; even in one’s suffering and dying there can be many blessings and opportunities to grow and love and feel and learn. I am sad this young woman, and her family and friends, missed out on potential glimpses of grace—words, emotions, epiphanies, touches, human and divine experiences, that can only be had by going through deep despair and grief, rather than around it. One could wonder, what in the world can we learn from despair and grief, pain and suffering? Why not avoid it, if we can? But I believe that life has something to teach us no matter how painful, or positive, the experience might be. This “level of intimacy” occurs with those that suffer along with us—through their thoughts, words, visits, hugs, prayers. If they could take away our pain, they would; but they can’t, so they sit by our side and are simply present. This is the stuff that grows our soul. It is our chance to be Christ to others, to be compassionate, to love our neighbor. And, no doubt, another time, it will be our chance to receive the Christ that others will offer us. Spiritual growth occurs only when we dig deeply into the stuff of life—the joys, the pains and the ordinary. It comes from being present in whatever the present moment holds. Gratefully, I have been on the giving and receiving end of this intimacy. It is, indeed, a life-changing, “God is so real to me now”, filled-with-gratitude-despite-the-pain-and-suffering experience. When my friend, Joyce, and my daughter, created an altar for me, I was on the receiving end of this grace and it still takes my breath away. (Altars: A Sacred Space) There have been many other moments as well. But Brittany Maynard’s decision to take her life hits close to home for me. Ten years ago I was able to be with a dear friend in the weeks, days and hours before she decided to take her own life. She was in a tremendous amount of physical pain; spiritually in despair; mentally, psychologically and emotionally in need of more help than the medical and psychological community could provide. It was overwhelming for her, her family and her friends. She was visited, loved, supported and prayed for, but nevertheless, she decided to end her life. I hope it gave her comfort that we met her in her pain, even though we couldn’t bring her healing. I’ve never been surer of anything in my life—being with Colleen in her pain changed me. This is what we do for those in pain, for those we love: we give what we can, we are compassionate, we pray, we forgive. Colleen, Joyce and me on our first retreat. 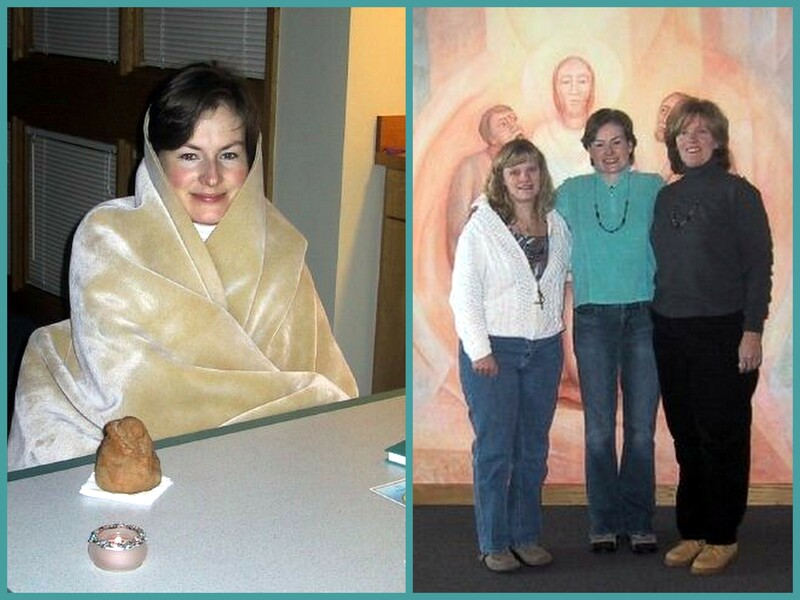 Losing Colleen, just as in meeting her, was a holy encounter. In the grief of loss, I was focused in the present moment like I have only been a few times in my life—at the birth of my first child, Jessica, which was a celebratory, euphoric present-ness, and then the miscarriages of my next two babies, which challenged all of my beliefs about life and fairness, plans and impossibilities. The experience of loss presents now-ness in a way that there is no escape. The now is felt at the most primitive level of aliveness, the most primal level of awe and appreciation. Even as one wishes the sadness, the despair, and the questions away, I, at least, was so grateful and in love with the idea that God was still there for me and comforting me in my pain. I’ve never been more certain that God was present, even in this most horrific time. I was clearer in my faith, more aware of humanity’s frailties and my ability to forgive, to understand and to be gentle with those around me. I was filled with gratitude and appreciation for the friendships I made through Colleen and the support so many gave to me. I was desperately sad that Colleen didn’t feel the same, just as I am sad that Brittany Maynard denied herself this chance to feel God’s presence and love when perhaps she was least likely to expect it. SoulCollage card named “Colleen”; Colleen loved red shoes! When we allow someone to suffer with us, we become more like Christ. We allow something sacred and holy to happen that no human being can orchestrate, control or manage, it is just God working in our present moment. We just don’t always SEE the big picture…we are so limited in our vision. I don’t think I have the answer for everyone, but I do think I’ll just wait it all out and let myself NOT control this part of life. For me, this is freedom. Dear friends: Like many of you, I was very saddened, and not a little disturbed, by the death of Brittany Maynard, the young woman suffering from brain cancer who took her own life this week. May she rest in peace. I do not wish to judge her at all, pray for her happiness in the next life, and pray for the consolation of her family and friends. But I was very disturbed by her idea of “death with dignity.” For me, any life has dignity, and the notion that being helpless, or even suffering, somehow lessens a person’s “dignity,” goes against my Christian belief of the sanctity of all life. Jesus’s life had great dignity even when, perhaps especially when, he was on the Cross. Here is someone who knows about that topic from close experience. Please read Jason Welle’s beautiful piece, in response to Ms. Maynard’s death. Jason, a Jesuit scholastic, accompanied both his brother and his father, as they neared death and finally died. He has some important things to say about what it means to die with dignity. “No,” he writes, “dignity isn’t opposed to suffering; sometimes in suffering dignity reveals its truest face.” May Jason’s brother and father, and Brittany Maynard, all rest in the peace. I read your words but most importantly I listened to what you said.